Bring the water or dashi to a simmer and add chopped onion. Allow to simmer until the onions soften, about a minute or two and add wakame if desired. 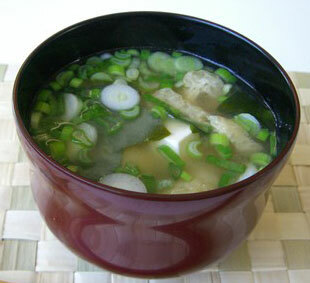 Take a few teaspoons of the broth and mix with the miso paste and stir to create a smoother consistency. Add the softened miso paste to the broth and mix in well. Simmer the broth for another 5 minutes and add tofu, and any other desired items (vegetables, noodles, etc). Ladle into your bowl and enjoy. 1 Dashi is a stock considered fundamental to Japanese cooking and made with kombu (kelp) and katsuobushi (dried bonito flakes). 2 Wakame is a type of edible kelp added to soups and salads in Japan.